President Trump made an excellent choice with Sarah Huckabee Sanders, the fruit doesn’t fall far from the tree. Sanders did not take more than 10 seconds to dispense with this question. “No, he’s talking about the problem itself growing and getting bigger,” Sanders said. Acosta attempted to ask another question, but Sanders quickly moved on to another reporter. This is why I am so proud of Sarah! She holds her ground and she is not letting things get out of control. She is a blessing for sure! 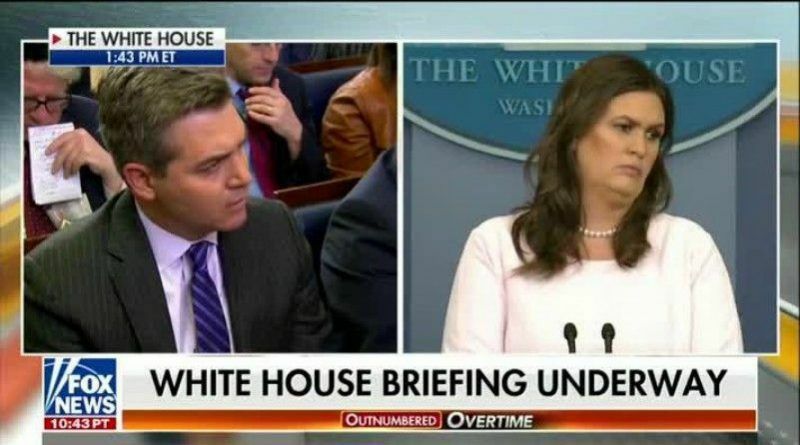 But, could it be more obvious that Sanders can’t stand Acosta? Can’t blame her. That second question was hilarious. This guy is not very smart and shows his ignorance but asking such questions. Acosta doesn’t understand what breeding means. That’s a shock to no one. He gets more desperate and dumber by the day! What do you think? Share this article if you agree with Sarah Sanders! Did LeBron James Purposefully Bypass A Fan Who Was Wearing MAGA Hat?